- NUMEROUS USES as canoe anchor, fish cleaning or makeshift tent stake make this a camping essential. - LIGHTWEIGHT CARBON STEEL with modified "D" handle let you tackle labor-intensive tasks with ease. Even if you only plan to add it to your emergency preparedness supplies, you will have the peace of mind that our Military Shovel is ready for the zombie apocalypse or any other crisis situation. 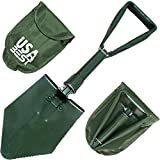 Military Shovel - NATO type black or green folding Military Shovel. Use it in the garden or take it camping. Carbon steel with Aluminium bolts.